Rui Matsunaga is a Japanese born artist who lives and works in London. She graduated from the Royal Academy of Arts in 2002 and will be exhibiting with PAPER at Manchester Contemporary 2017. Here we catch up with the artist about her practice. Sara Jaspan: Could you tell us a bit about your practice? What subjects does it deal with? What references do you draw upon and from where do these originate? What ideas or concerns are you interested in exploring through your work? Rui Matsunaga: I am interested in creating imagery that implies a certain narrative and sense of poetry. I draw inspiration from myth, folklore and popular culture such as books, films and manga. I am also very drawn to the idea of animism – that everything in the world has a consciousness and behind all things there is anima. Animism has been a way of understanding the world since ancient times and still continues to some extent today. Old Japanese scroll paintings (emakimono) are a big influence for me, especially the Chōjū-jinbutsu-giga from the 12th century. They are visually woven with animism and possess an ambiguous sense of story-telling that I love. The manga films of Hayao Miyazaki are also very important. I’m drawn to their subject matter (which often deals with the complex shades of human light and darkness), and the way that the animals are drawn. Each of his works are based on such acute observation and affection that everyday actions become beautiful expressions of humanity. In my own work, I like to create a type of landscape that is not a real but touches upon an inner reality; our sense of time passing, its inevitably and the knowledge that nothing can prevent or change this. Lives are born, rise, fall and die, but the vast landscape continues on as it always has. Our lives are mere echoes that fade. The seasons pass and the wind blows the same. The sense of time and space where everything happens in a place of joy or tragedy passes eventually; leaving, as if everything was a dream. SJ: Your paintings are said to touch partly upon the idea of a post-nuclear bombed society, and the cultural impact of this in relation to nature and fiction. Could you expand upon this? RM: As a post-nuclear bombed country that has undergone intense industrialization including nuclear power in the 1970s and 80s, Japanese society and culture shows deep concern for the environment. This is reflected in TV series like Godzilla (a giant salamander mutated by radiation), and manga such as Katsuhiro Otomo’s Akira and Hayao Miyazaki’s Nausicca. Both Otomo and Miyazaki present post-apocalyptic worlds and focus on stories of survival, leading to new understandings of reality and our relationship with nature. I paint small creatures such as frogs and rabbits often in deserted, bone scattered, ruinous landscapes. These images are intended as dystopic visions of the possible future we might be creating for ourselves. Though they appear as animals, the creatures could also be seen as projected forms of ourselves, tapping into a critical core where everyday reason and logic is suspended (in the same way that a fight with Godzilla can be metaphorically understood as a symbol of our fear and concern for the environment, for example). SJ: Similarly, your work is said to deal with the increasingly technology based nature of society today. How do you think technology has shaped us and our relationship with nature? And how is this explored in your work? RM: My work does not deal with the technology based nature of society, but rather I draw inspiration from the type of change occurring in our culture as a result of today’s increasingly technological world. Myth and folklore are constantly being reshaped, morphed and retold to fit the needs of the time. And with people continually moving from one place to another, cultural crossover has become far more significant. As a result, the narratives we carry have had to change. For example, I have recently been working on a drypoint piece inspired by Albrecht Dürer’s Apocalypse series. In Dürer’s prints, God and His angels are a type of transcendence which infuse all beings with the principles of monotheism. Transcendence is like a single beacon on top of a hierarchy. In such a system, everything has its value set by referring to the top beacon, which creates light and shadow, good and bad etc. However, in today’s more secular and scientific world, such divinity or judgement is less applicable. I therefore wanted to create a more ambiguous image of how an apocalypse might be, and fuse it with a mythological vision of our relationship with nature over the remaining course of the 21st century. SJ: You seem to also reference European folklore and art history (Renaissance painting, drawings and etchings etc.). Is this deliberate? Are you consciously trying to merge or examine the relationship between different cultures? RM: Living in the UK and frequently visiting museums containing a lot of European Western paintings, it’s hard not to be inspired and influenced by the work that I see. I’m also very interested in Christianity as it plays such a central role in the old masters’ works. When you look at older works of art, they are often infused with stories from the Bible, Greek mythology and folklore, and this can play a significant part in understanding what the work is about. I like this aspect as it adds another layer of story – the artist expanding on the original. This makes me want to expand in my own way, to help the stories continue on. SJ: What draws you to the medium of paper? Do you work across other mediums as well? RM: I mostly create oil paintings, drypoint etchings and drawings. I like the boundary of the frame in which I can explore many layers of narrative. I’ve always admired story book illustrations and manga comics, some of which are utterly beautiful. And I love paper as a material itself. I have seen some of the amazing ways it can be made, such as Samarkand silk paper which is polished using stones and shells, and am fascinated by the many methods and often locally sourced materials that are used. SJ: You’ll be exhibiting with PAPER at this year’s Manchester Contemporary. Is this the first time that your work will be shown as part of the fair, and what pieces are you planning to exhibit? RM: Yes, it’s the first time. 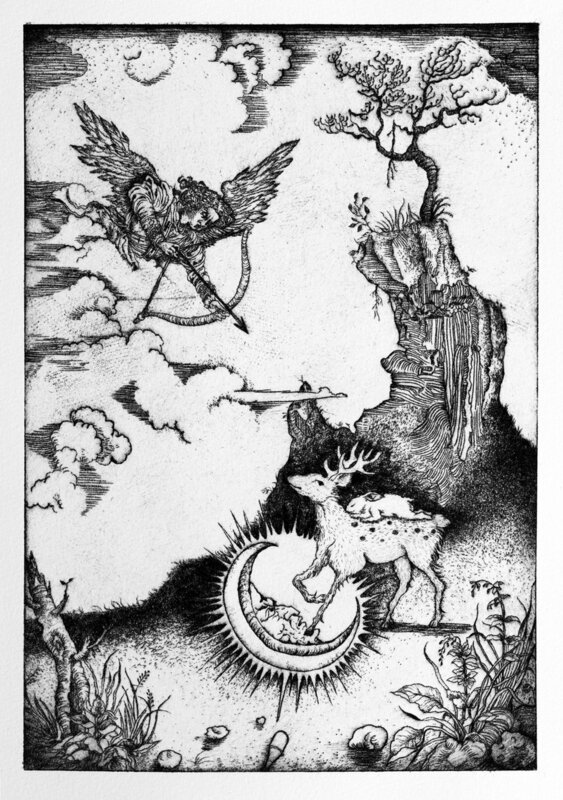 I’ll be showing a series of drypoints inspired by Albreht Durer’s woodcut series of The Revelation of St John. SJ: Where do you think your work sits in relation to the field of contemporary painting today? RM: I’m on the margins of contemporary art. I make only what I am inspired to make. I let others to decide where my work sits. SJ: How do you think your practice will develop going forwards? RM: This year was dedicated to creating a series of etchings. I have just returned from a three-week journey across part of the Silk Road. It started in China at the extraordinary Buddhist painted Dunhuang caves, and ended at Uzbekistan’s beautiful mosques, palaces and the Necropolis, which opened my eyes to the crossroads of cultures and beliefs at the edge of China and Central Asia. I think next year will be about how those inspiring experiences will visually inform my paintings.